Dominance? We talkin’ bout dominance? Better start talking about the USA women’s basketball team in these Rio de Janeiro Games. While the men’s hoop squad needed a Carmelo Anthony heat-check to escape Australia on Wednesday night, the women’s team squashed a similar challenge. The women trailed early against Serbia, reigning champions of the top-flight EuroBasket league. Then they bore down, withstood several late charges and pushed the final margin to 26 points. 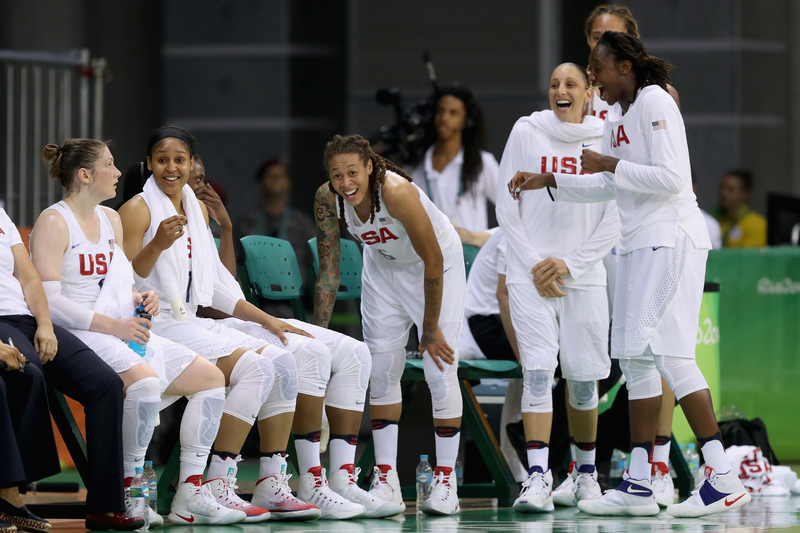 The U.S. bench laughs during the closing moments of their 110-84 win over Serbia in the Women’s Basketball Preliminary Round Group B match between China and Spain on day five of the 2016 Games at Youth Arena on Aug. 10 in Rio de Janeiro. The men? They trailed by five at halftime and traded leads well into the fourth quarter. Australia’s Patty Mills, who averaged 8.5 points off the bench for the San Antonio Spurs last season, scored 30. To put the game away, the USA needed a series of 3-pointers from Anthony (31 points), then a dagger 3 from Kyrie Irving that made it 93-86 with 1:35 left. The two games highlighted the contrasts that put the women’s team further ahead of the competition. Basketball stars LeBron James, Stephen Curry, Russell Westbrook and Chris Paul are on vacation this summer. But the women have all of the best players in the world. Maya Moore on the wing. Brittney Griner in the post. WNBA MVP Elena Delle Donne and heir apparent Breanna Stewart off the bench. Not to mention Diana Taurasi, “The White Mamba,” relishing her fourth and perhaps last Olympics by taking over games rather than facilitating. She dropped 22 points and five 3s in the first half against Serbia. Asked why this team seems more dominant than her previous Olympic squads, Taurasi said, “The talent on this team is just so versatile. Is her team more dominant than the men? “That’s not for me to say,” Taurasi said with a smile. The women also have played more together. “The experience factor, having nine players back from London [in the 2012 Olympics], I think that really means a lot,” said women’s coach Geno Auriemma. On the men’s side, 10 players are in their first Olympics. That showed against Australia, with poor spacing and quick, forced jumpers instead of patient passing leading to easy shots. 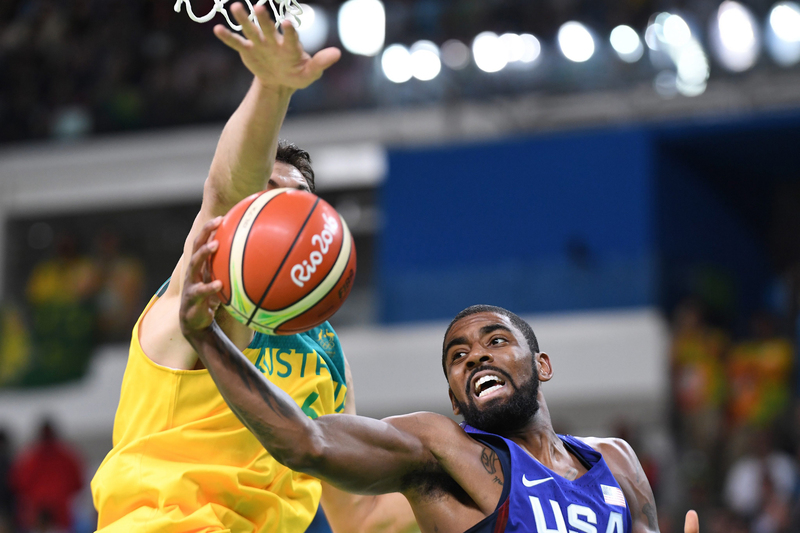 Australia’s Andrew Bogut (L, obscured) tries to block USA’s Kyrie Irving during their Men’s Preliminary Round Group A match between Australia and the USA for the 2016 Games at the Youth Arena in Rio de Janeiro on Aug. 10. Tamika Catchings, a former MVP and the WNBA playoff scoring leader, is also playing in her fourth Olympics. “I feel like for us it’s been truly an honor to represent my country and I can’t imagine having that opportunity presented to me and not being like, ‘Oh, yeah, I’m going’ … I wouldn’t even think to say no. The women’s journey includes five straight Olympic gold medals, 44 consecutive Olympic victories, and an average margin of victory of 30 points. Their only recent misstep has been losing the FIBA world Championship to Russia in 2006. The men won the bronze in the 1988 Olympics with college players, and gold in 1992 with the original pro “Dream Team.” After golds in 1996 and 2000, they lost three games at the 2004 Olympics and took home a bronze. That’s when coach Mike Krzyzewski took the helm and has delivered Olympic golds ever since. At the 2012 London Olympics, the men won the gold-medal game by seven points; the women won by 36. In 2008 in Beijing, the men won gold by 11; the women by 27. Like Taurasi, she declined to say outright that the women are more dominant than the men. “Yeah, we have a little longer winning streak, but that’s why I said America needs to recognize us a little more. It has nothing against the guys,” McCoughtry said. “Put us on the Wheaties box, get these girls some more endorsements that they deserve. Jesse Washington is a senior writer for The Undefeated. You can find him giving dudes the bizness on a basketball court near you.